Imagine Thousands Of Links Back To Your Web Site From Other People\'s Blogs Starting Today! • Use those keywords to find relevant blogs on https://www.tradebit.com. Think about it. Everybody knows blogging has surpassed e-zines and articles in terms of popularity. Blogs are where people go to get the real scoop on what\'s going on in today\'s Internet world. And there are millions of blogs. Now I\'m not talking about junk comments- I\'m talking real personal comments just like the one\'s you now post..
\"I just came across your blog about **keyword** and wanted to drop you a note telling you how impressed I was with the information you have posted here. I also have a web site & blog about **keyword** so I know I\'m talking about when I say your site is top-notch! Keep up the great work, you are providing a great resource on the Internet here!\"
The second **keyword** token in the text above will contain a link back to your web site! Blog Link Generator automatically replaced **keyword** with the list of keywords in the software that are relevant to your site! It could take you hours a day to find relevant blogs and post a comment with a link. Not to mention the carpal tunnel syndrome and eyestrain you’ll get. I’ve been there. I used to spend, like, six hours a day getting keywords from Google Sandbox and Overture, then hunting down blogs with those keywords, and posting comments with a link back to my site. I spent a week writing down how much time I spent doing all that blog stuff, then I looked at what my site was bringing in. Know what I was making per hour? That’s right, $10 an hour. I could’ve made more working fast-food. At that point, I realized there had to be a better way—I had to automate this process if I was ever going to make it pay off. 1. Take my keywords or keywords from Google Sandbox or Overture. 2. Find blogs with those keywords. 3. Post a comment to those blogs that includes the keyword. 4. Include a link back to my site in the post. 5. Increase the heck out of my site traffic. After extensive research, he figured out what needed to happen and he went to work. He developed the tool Blog Link Generator. It finds revelant keywords, finds the blogs, and then posts a personal comment right from me! The result? Your site gets listed WAY UP HIGH in the search engines without you having to write a word of content! If You have always wanted to be able to quit your day job and break into the Internet Marketing world Blog Link Generator is a great way to do it! Grab this software now! How Much Money Could You Make From Having Thousands of Links Back to Your Site, Propelling You Up To The Top Of The Search Engine Listings? Blog Link Generator is so easy to use, it’s like having your very own money machine! • Ability to plug in keywords – or get them from Google Sandbox or Overture. • Links back to your site – get thousands of hits! • FAST results – how fast? Some people have gotten into Google literally overnight! • FAST results – After Blog Link Generator makes your post it sends that persons blog to Pingomatic automatically to make sure you link is picked up in record time! • Huge traffic increases – the spiders find you, and you know what happens next. It’s all good! Visitors come, they click on the ads, Google AdSense sends you huge checks. • Turbo charge your ranking – very soon you’ll notice a distinct boost in rankings, which will boost ad revenue! 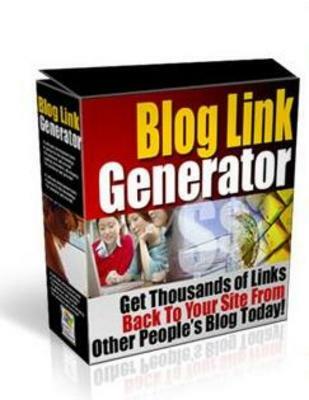 Blog Link Generator blog automation;blog link generator 32161520 7.99 unlimiteddownload Fresh Download Available!